The HC6211FR is a four zone, ceramic hob with easy to use, side rotary controls. It has a sleek, frameless black glass design with an easy clean surface for quick maintenance. The HC6211FR has side rotary control out of reach from children for safety. The HC6311FR is a sleek ceramic four zone hob on black frameless glass. The hob has 6 power levels with an easy clean surface and residual heat indicators alerting you when the hob is too hot to touch. The HC6621FR is a four zone, touch control ceramic hob. It has a sleek, frameless black glass design with an easy clean surface for quick maintenance, auto safety switch off and a safety key lock to prevent accidents and overspills. The HC9621FR is a five zone, touch control ceramic hob. It has a sleek, frameless black glass design with an easy clean surface for quick maintenance, a timer for accurate cooking, auto safety switch off and a safety key lock to prevent accidents and overspills. Five cooking zones across a 90cm width gives the cook ample space to utilise and manoeuvre pans. Built from Schott© shatterproof safety glass and finished with minimalist zone etching, CDA’s ceramic hobs look stylish and modern in any kitchen. There are different sizes to choose from including standard 60cm models and a spacious, 90cm wide model. Scroll up to see an ‘at a glance’ view of the zone layouts available and choose a model that works for your cooking style. We have included important safety features throughout the range to provide your family with the best safety standards in the kitchen possible. You can choose between touch controls that are easy to keep clean or ergonomically designed control knobs that are comfortable to grip and easy to use when switching the power between single and dual zones. Ceramic cooking is great for quick heating, easy cleaning, low maintenance and modern styling with flush black glass and stylish grey etching. There is an LED digital display on each of our models to let you know what power level has been selected, which zones are in use as well as if any special functions are being operated by the user. All of these elements work hard beneath the surface so that you can enjoy an easy and responsive cooking experience. At the smallest end of the scale, we have a ‘domino’, two zone ceramic model that features a double cooking area and fits into a 30cm wide space. This is ideal for even the tiniest of kitchens or for providing the electric option to a personally created combination of domino cooking styles, if you like to switch between gas and electric hobs. It is touch control to maximise the ‘easy-clean’ aspect of this design. There are a few 4 zone models to choose from as this is our most popular style. Many customers find that 4 zones is plenty to cope with reheating, frying, simmering and boiling simultaneously. Some may prefer a front control layout, while others prefer the safety of having the controls to the side-so we have designed and made both! There is even our linear design where the 4 zones are positioned in one long line, giving the cook maximum space to move pans around; this looks great on an island unit. There are also 5 zone variants in our ceramic range that give you even more cooking options and space. We have varied the layouts again so that you can choose between the styles to suit your individual cooking needs exactly. There are dual zones, both in a round and oval design so that you can use either power level and cooking zone size, to fit your cookware perfectly. 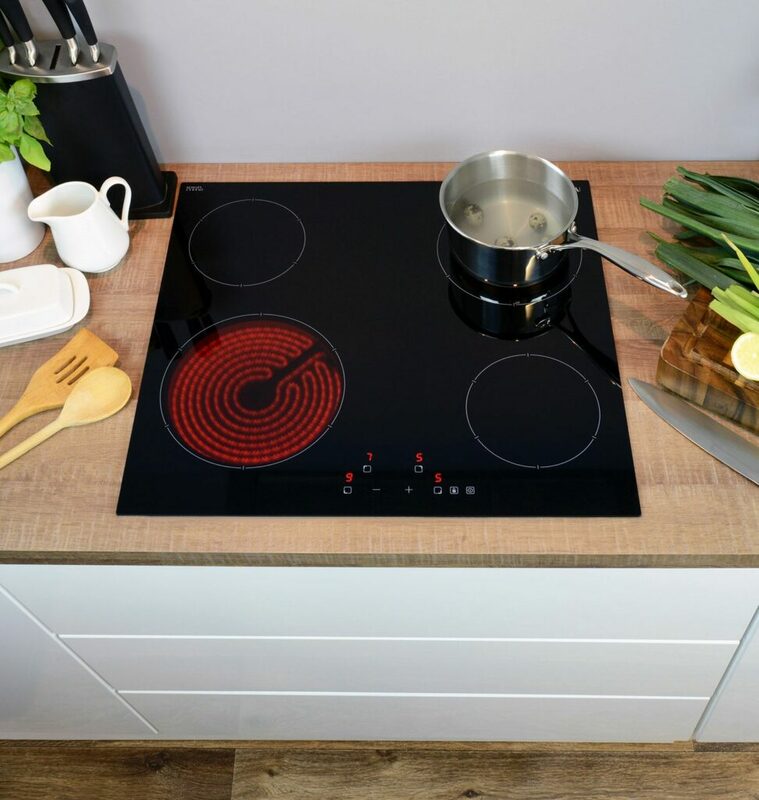 Our ceramic hobs come with 9 power levels for accurate control, the choice between touch control or control knobs, residual heat indicators for safety and boosters for extra power when you need it. 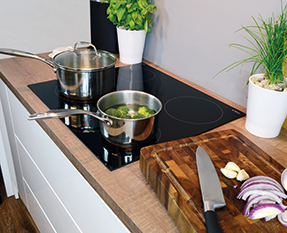 When you have selected a size and style of ceramic hob, be sure to take a look at our extractor range to match the width size and give your kitchen the best extraction power possible, keeping your home fresh and free of cooking smells and grease.